Inspired by his Dad, who would burst into his room playing guitar and singing blues songs he made up about going to school, music has become Joel’s passion. Not very surprising, when you see the lineage of the Leffler family. Turns out that the Leffler music heritage stretches well back into the 18th century, with multiple successful Professors of Music sharing a direct bloodline with Joel. Joel’s journey began in 2003 when he woke one morning to find that his Father had fulfilled his birthday wish. At the end of the bed was a brand new acoustic guitar. ‘You would think when I was a kid, my father bursting into my room with his guitar singing blues songs he made up about ‘getting up & going to school’ would have turned me off music, but it in fact did the opposite. He bought me my first guitar, taught me my first chord and booked me my first gig at 16. He inspired me to not only become a singer but a writer & creator’. 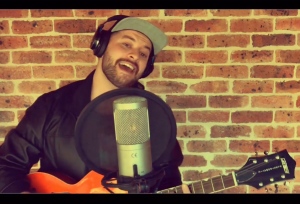 Now with 10 years of song writing under his belt, 2 nationally recognised song writing awards, 4 top 10 Triple JJJ Unearthed charting songs & a string of appearances on stages around the country, Joel is within arm’s reach of matching his forefathers. Joel’s new EP, ‘Run With The Wolves’ is produced by Sony Music Australia’s in house engineer Pete Holz & mastered by Grammy award winner William Bowden.